infections caused by aerobic gram‑negative organisms in adults with limited treatment options. Our 2-page summary to support local decision making includes data on effectiveness, safety, patient factors, resource impact and resistance. The evidence summary includes information on: regulatory status and indications, key messages, resource impact, current guidance and place in therapy. See the full evidence review for more information. Is this evidence summary up to date? The content of this evidence summary was up-to-date in November 2017. See summaries of product characteristics (SPCs), British national formulary (BNF) and MHRA website. 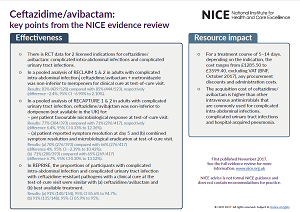 The evidence summary: process guide (2017) sets out the process NICE uses to select topics for evidence summaries and details how the summaries are developed, quality assured and approved for publication.